There is a gluten-free Christmas pudding recipe in my cookbook, a Handful Of Flour, but I wanted to make it a little different this December. In this recipe, I’ve played up the figs as per the Christmas carol refrain; now bring us some figgy pudding… I’ve also added cardamom and chestnut flour, which along with the orange zest, complement the flavours of the figs beautifully. Think of the spicing in this recipe as more of a guideline, which you can adapt to suit your favourite flavours. The cardamom blends in with the mixed spice, so add more than the teaspoon I suggest if you want the flavour to stand out. This pudding can be eaten on the day of making, and it should not be stored for more than four weeks. It must be stored in a cool, dark and dry place. Measure all the dried fruit into a large mixing bowl. Add the calvados into the bowl and begin stirring. Add the grated apple, almonds, orange and lemon zest and the orange juice, and give it a really good stir with a mixing spoon. Cover the bowl with cling film and leave overnight for the fruit to soak up the liquid (you can skip the overnight soaking if you don’t have time). The next day, butter a 1.2 litre pudding basin, place a disc of buttered greaseproof paper in the bottom, and have some string, greaseproof paper and foil ready to make a lid for it. Weight the chestnut flour and sugar into a separate bowl, and add the mixed spice, cardamom and nutmeg. Combine thoroughly, before adding to the soaked fruit and stir. In a small non-stick saucepan, begin to melt the butter over a low heat. Remove the pan from the heat when the butter is roughly one third melted, allowing it to liquefy at a cooler temperature. Whisk the two eggs until frothy in a bowl, then stir the melted butter followed by the beaten eggs into the Christmas pudding mixture. Make a wish! Spoon the mixture into the prepared basin. If it doesn’t come with a lid, you can make one using a sheet of foil and a sheet of greaseproof paper. Place the foil on top of the greaseproof paper and fold a 2.5cm pleat down the centre. Cover the top of the basin with the foil on the outside, and the pleat running down the middle of the bowl. Tie tightly with string under the rim of the pudding basin. Trim off the excess leaving roughly 5cm of foil under the string. Tuck the remaining foil up and under the greaseproof paper to seal it in. Tie a string handle so that you can lift your pudding in and out of the steamer or pan. Stand the pudding in a deep pan of hot water on a heatproof metal trivet to prevent the basin from touching the base of the pan. The simmering water must come half way up the basin for the pudding to cook properly, but no higher. Simmer gently for 4 ½ hours, topping up with hot water as necessary. Check on it regularly to make sure it doesn’t boil dry, and making sure the water doesn’t get in. Once your pudding is cooked and has cooled completely, replace the lid with a fresh layer of greaseproof paper and foil, and tie securely. 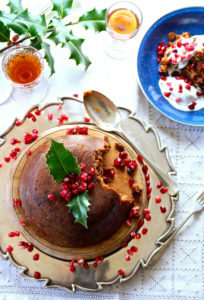 If you’re not eating the pudding on the day of making, to serve at Christmas, re-heat it for 2 hours using the same method as for the first steaming. Serve with brandy butter, custard or cream. I like to sprinkle some fresh pomegranate seeds on for a burst of flavour and colour as well.